After a 12-hour dive, we watch as ROV SuBastian returns safely to the aft deck of R/V Falkor. When the 6,000-pound remote-operated vehicle (ROV) is secure, we grab our buckets, eager to get our hands on fresh sediment cores. Collected from the sea floor just over 2,000 feet below us, these cores provide valuable insight into methane seep communities. While ecosystems on land (and at the ocean’s surface) depend on photosynthesis, the organisms we are studying thrive on bacteria that use methane as their primary source of energy—a process we call chemosynthesis. Even though these seeps seem like a vastly distant world from our day-to-day environment, the microbes here play a critical role in processing this major greenhouse gas and maintaining a healthy atmosphere for our planet. As we begin processing our samples on the aft deck, we reflect on how we came to be a part of this incredible experience. 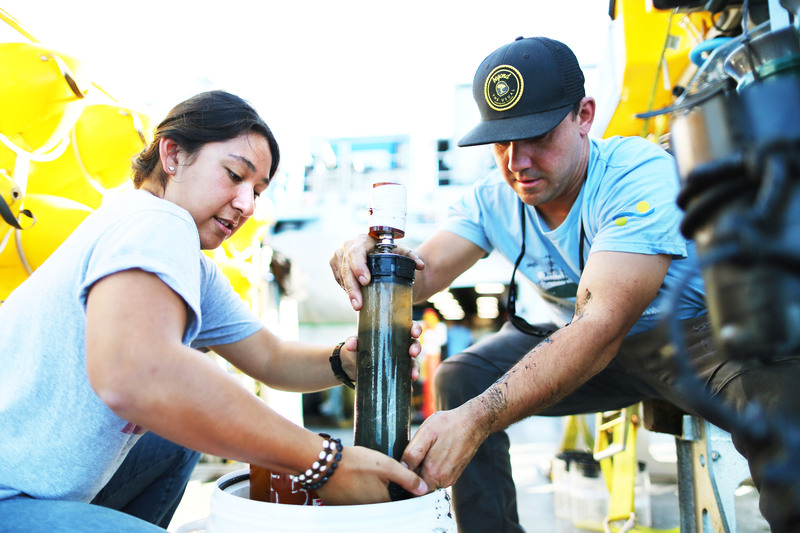 The diversity of our science team reflects the different paths we took to get to this point—on an oceanographic research expedition to better understand the unique underwater ecosystems off the coast of California. Growing up as the daughter of Vietnamese refugees, I was always told that an education meant greater opportunity and purpose. I am the first person in my family to receive a college education, much less pursue a PhD. While the younger version of myself focused on simply earning a degree, I now view my research as an invaluable opportunity to implement positive changes in our society. After I graduated from UC San Diego with undergraduate degrees in Environmental Systems and Economics, I began graduate school at the Scripps Institution of Oceanography. Now, as a fellow of the Program for Interdisciplinary Environmental Research, I am excited to put my education to work. 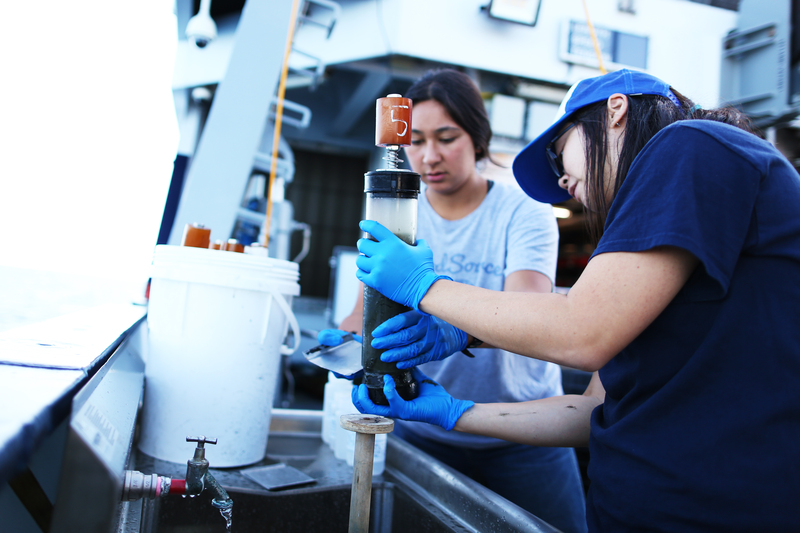 Jennifer Le shows Haleigh Yang how to extract sediment cores from their tubing on the aft deck of R/V Falkor. Too often we think of the environment and extractive industries as butting heads, a question of “either/or”: either we conserve the environment, or we extract its resources. However, I like to frame the question as “how”: how do we balance these two seemingly opposing forces? My current research focuses on deep-sea ecosystem services together with the structures and functions that support them, in an effort to incorporate the value of natural processes into environmental decision-making. For example, the Pacific Fisheries Management Council is considering designating methane seeps as essential rockfish habitat, which would provide protections for both fisheries services as well as additional services associated with seeps (like nursery grounds for sharks and rays, sequestration of methane). I often find myself working at this nexus of natural and social sciences, which places me in a unique position to apply my science to real-world issues and contribute to actual solutions in a meaningful way. This expedition on the R/V Falkor is helping me achieve this goal by allowing me to visualize deep-sea organisms and how they use their environment—which helps inform our efforts to effectively protect them. Like many teenagers, I still had not found my “passion” by the time I turned 18. I decided to attend a community college in my hometown (Sacramento, California) to figure out what I wanted to do. I bounced around majors before ending up in a class that focused on the interactions and impacts between humans and the environment. After taking that class, I knew what I wanted to do. 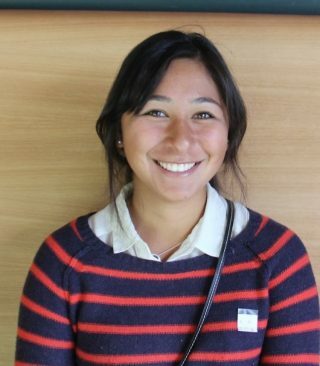 Two years later, I enrolled at UC San Diego to pursue a major in Environmental Systems, an interdisciplinary program that provides students with a well-rounded foundation in natural and social sciences. 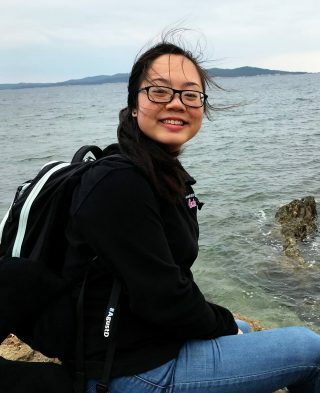 Now in my final year, I am working on my senior thesis under Dr. Lisa Levin to develop a greater understanding of the vast biological diversity found within these rotten-egg smelling sediments. Attending a community college ultimately set me on a path towards the field of scientific research. 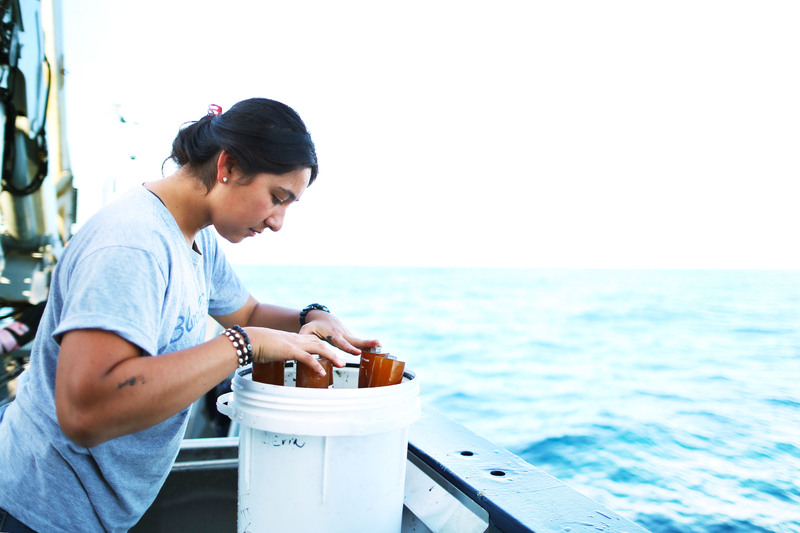 The Scripps Institution of Oceanography allowed me to take advantage of both hands-on and computerized marine research, shifting from coral ecology to deep-sea ecology—all within my first year! I am grateful these experiences have led me to where I am now: sailing down the coast of California with a remarkable group of people, working with state-of-the-art technology, and gathering incredible scientific data every day.